eCommerce analytics that delivers curated, personalized insights, and recommended business actions to merchandisers and commerce professionals. Learn how Carhartt uses AI to identify buying trends in real time with IBM® Watson® Commerce Insights. IBM Watson Commerce Insights can help you combine the art of online merchandising with the science of eCommerce analytics. 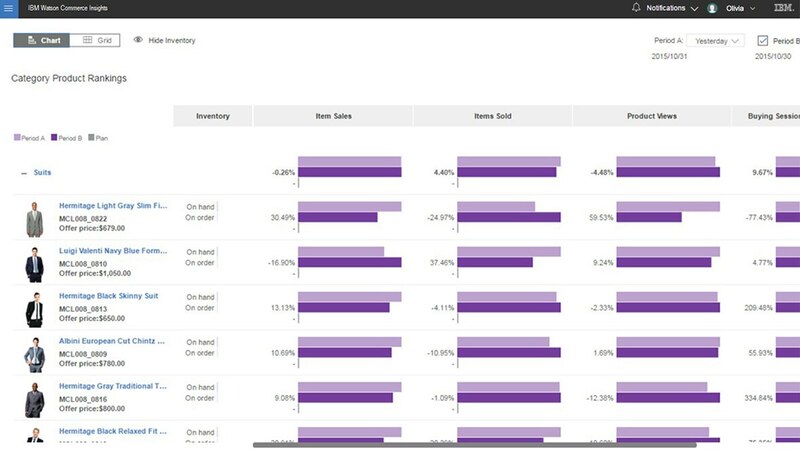 Watch this webinar to see how you can glean retail insights and drive business results through Watson Commerce Insights. Are You Prepared for Your BIGGEST Holiday Season Yet? You only have one chance to get this right - are you ready for a dramatic increase in holiday traffic and sales? IBM® Watson Commerce Insights helps business users make sense of vast amounts of disparate data. From insight to action to results - IBM Watson Commerce Insights is helping merchandisers.